From 1901 to 1903, the Galt Football Club won the Ontario Cup, defeating teams from Ontario, Quebec and Manitoba. When the 1904 Olympics were announced for St. Louis, Missouri, many teams withdrew from competition due to travel costs and previous losses to the Galt team. The Galt Football Club travelled to St. Louis on a special steam train decorated in red and white, along with 50 supporters and the Mayor of Galt. In the first game, Galt defeated the Christian Brothers College 7-0. The following day, in the game against St. Rose, Galt won 4-0, claiming the gold medal. The team was welcomed back to Galt by 3,000 cheering fans. 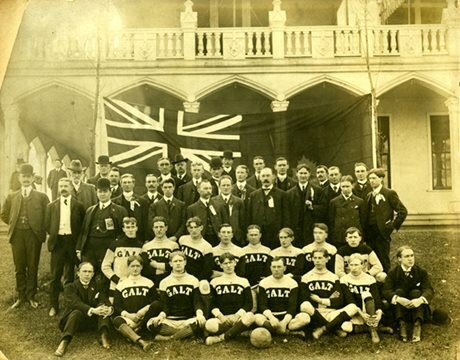 Learn more about the Galt Football Club on the Soccer Hall of Fame and Museum website. Read more about the Galt Football Club – including player biographies and team stats – on the Canadian Soccer History webpage.